Donny Yen reprises his role as Ip Man. Note that this is “living” dummy suspended from two slats. These are held in place by vertical supports attached directly to the wall. Images such as this have helped to popularize the Mook Yan Jong throughout the martial arts community in recent years. Recently I have been spending a lot of time (and practice hours) thinking about the Mook Yan Jong. This type of wooden dummy is commonly used in Wing Chun schools around the world. I had not been planning on buying a dummy. I don’t really have the space for one at the moment. But when my Sifu called me up and told me that he was arranging for a container shipment to be sent from China, and that the new Jong would be ridiculously cheap, I couldn’t say no. A few weeks later I found myself opening a large box with a honey blond laminated wooden dummy. I was pleasantly surprised to find that my model had been shipped with a stand, so I was left with no excuse but to put the whole thing together, squeeze it into the corner of a room that was already too small, and begin to practice. I did not have regular access to a dummy for a couple of years, and my form had gotten a bit rusty. I had been practicing the other unarmed forms on a daily basis and was even able to get some chi sao training (“sticky hands,” a type of sensitivity training) with the students that I teach. Still, there had been a definite “wooden dummy shaped hole” in my soul. It did not take too long to get the basic choreography of the form dialed in. Still, the process may have been slowed as the new Jong did not feel quite “right” at first. That is to say it does not feel like my Sifu’s old dummy, the one that I learned on. The geometry, weight and materials on my new dummy are all correct, but it is interesting how even small differences can really be felt when you start to spend a lot of time working on them. Minor changes in the diameter of the arms, the profile of the leg, or how easily the Jong slides back and forth on its rails, are things that can be immediately felt. Probably the biggest adjustment that I am dealing with right now is the mounting system. Most “living” Jongs are suspended on two slats, which act like springs (see above). These thin strips of wood need to be just the right width so that they can support the dummy, but at the same time allow it fall back and then spring forward if it is struck the right way. Many people who don’t work with dummies erroneously assume that they are static conditioning devices. Nothing could be further from the truth. A good dummy can be uncannily responsive to a martial artist’s movement. 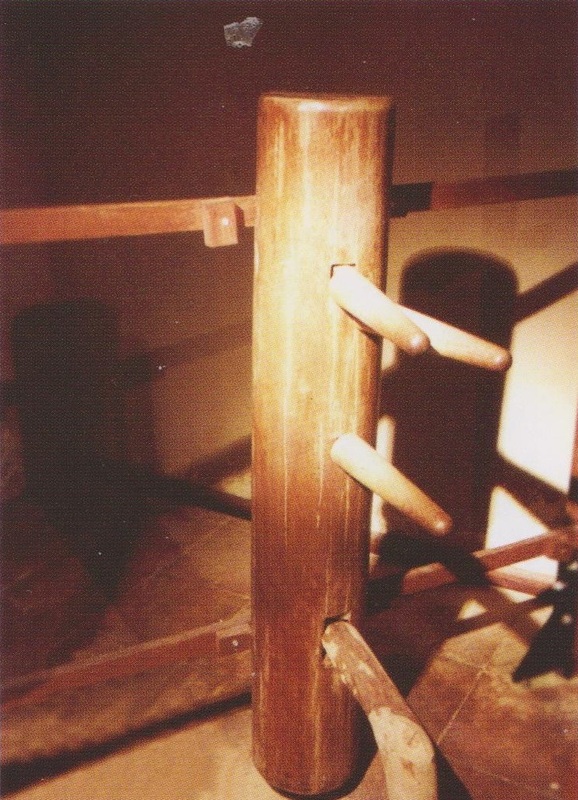 The wooden spring on a hanging Wing Chun Jong are generally mounted into brackets that are screwed into studs in the wall to insure that the whole thing is held securely in place. My model was shipped with a stand-alone frame, which was truly fortunate as I don’t think that my wife would appreciate it if I permanently mounted my “new friend” on the wall of the bedroom. But given its weight and the forces that a dummy is subjected to, getting these freestanding frames to function properly can be kind of tricky. To be totally honest I have no idea who made my dummy, or how much experience they have. But they ended up building a system that was actually pretty clever. The dummy itself hangs on very thick cross-beams. These have none of the “spring” that one expects to see in the normal sorts of slats that are employed in most wall mount systems. The rest of the frame, which doesn’t appear to be too heavily built, just blots together. It would be an understatement to say that I was ambivalent about how the entire thing was going to work. I just figured that at some point I would probably have to make another, more substantial, frame. Fortunately this stand has greatly exceeded my expectations. It actually has all of the stability and spring that one could want in a dummy. Obviously the key to creating the stability is to weight the base of the stand down with rice or sand bags. I think that this is where a lot of people go wrong. They never get the stability that they need to really apply the proper force to a freestanding dummy because they don’t use enough weight. Given my size and technique I found that I needed about 150 lbs of additional weight to create a level of stability that I was comfortable with. Once the base of the stand was properly weighted I discovered that the vertical upright poles on the left and right side which held the horizontal supports in place were capable of providing all of the “spring” that I really needed to do my dummy form. Part of this “springing” motion actually comes from the wooden poles flexing. The rest is provided by the natural play where the uprights are bolted to the various pieces of the base assembly. In short, this dummy works because the stand is really rather clever. Rather than simply trying to imitate a typical wall-mounted system (which would have been impossible to copy) it put the “springs” in the vertical parts of stand, not the horizontal. The owner still needs to weight everything down to really make it work. But I was genuinely surprised what a secure stand the manufacturer was able to put together for practically no money at all. I think that this is a great example of the “hacker spirit” that you see in so many places in the martial arts world. The fit and finish on my new dummy is pretty rough in places, even though it is substantially built. No one would look at this and conclude that it was the work of a “master craftsman.” But given that this is a tool that I plan on punching and kicking for the next 5-10 years, I think that it has everything I need. All of these positive qualities notwithstanding, it still feels very different from the Jong that my teacher taught me the form on. I can’t count how many dozens (maybe hundreds) of hours I spent on that dummy. It had its own eccentricities. The geometry of its arms was great, but the body was a bit light. By the numbers my new dummy is probably a better piece of training equipment. Yet it still feels like a stranger. I suppose that it is not all that different from working with a new training partner, someone who seems nice enough but who is basically an unknown quantity. I think that we are going to be friends, but only time can tell. Note that this student is learning on a “dead” dummy, the bottom half of which is buried in the ground. This more traditional method of dummy construction yields a training tool that is stiffer and less responsive to the martial artists actions. Source: This photograph is on display at the Ip Man Tong in Foshan. One does not need to be an experienced Wing Chun student to be fascinated by wooden dummies, or to draw a certain sort of meaning out of them. 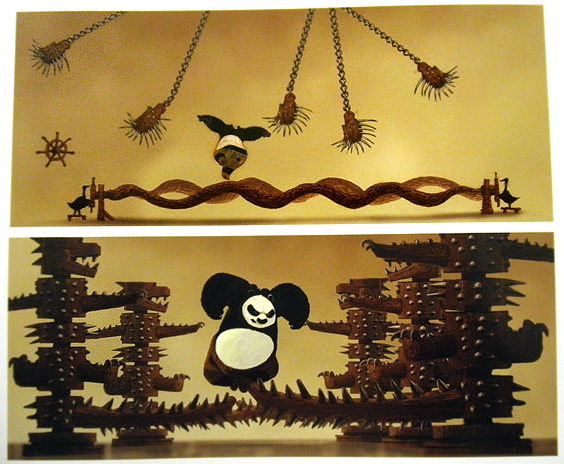 Indeed, images of deadly, seemingly diabolical, wooden training devices are a central aspect of the Shaolin mythos. The late Qing wuxia novel “Everlasting” (discussed at some length by Hamm) told of a special hall in the southern Shaolin Temple. In an attempt to insure discipline, and the strength of his order’s reputation, the Abbot decreed that no student could leave the school without passing each of the tests posed by these wooden dummies. The image of the Hall of Wooden Dummy Men proved to be explosively popular. It was adopted as gospel by later Shaolin storytellers. It made appearances in Hong Kong actions films and on 1970s American television programs. Echoes of this perilous testing device can even be seen in the elaborate training machinery (complete with “wooden crock-bandits”) of the current Kung Fu Panda cartoons. Given this strong mythic tradition stretching back to at least the 19th century, it is no surprise that the various Kung Fu and opera schools of Southern China (the vast majority of which claim to be descended from the Shaolin Temple) would adopt some variant of the wooden training dummy. Indeed, as useful as they are, the value of the Jong has never been entirely defined only by its practical functions. The very existence of such a device in a school bore a solid physical testimony to the lineage’s “Shaolin heritage.” To master the construction and use of the dummy was to place oneself within the sacred time of the Shaolin archetype. Notice that one does not need to make a choice between wooden dummies being valued in the southern arts for their practical importance or their mythic associations. In the case of this powerful symbol the two went together. The hours spent practicing the dummy were more than just training, they were (and remain) an almost ritualized activity. The myth of Shaolin gave this action social meaning and relevance. This allowed the student to transform his or her understanding of self at the same time that the discipline of the dummy refined their approach to Kung Fu. Today the Mook Yan Jong is once again emerging as a master symbol of the southern Chinese martial arts. It is starting to appear in new and strange places, far from the styles that originally taught it. 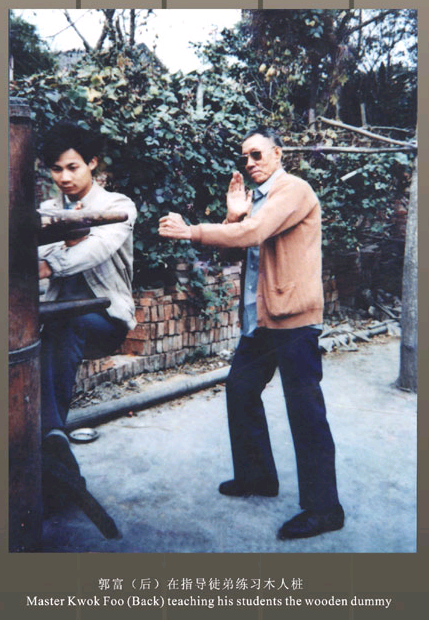 Bruce Lee and his association with Wing Chun helped to spread knowledge about Chinese wooden dummies in the 1970s and 1980s. More recently big budget films focusing on his teacher, Ip Man, have glamorized this once esoteric training tool, making it a virtual necessity in any well-appointed school. It is interesting to watch to various the Ip Man films and note when dummies appear. Wilson Ip used the Jong as a key visual symbol in his bio-pic. 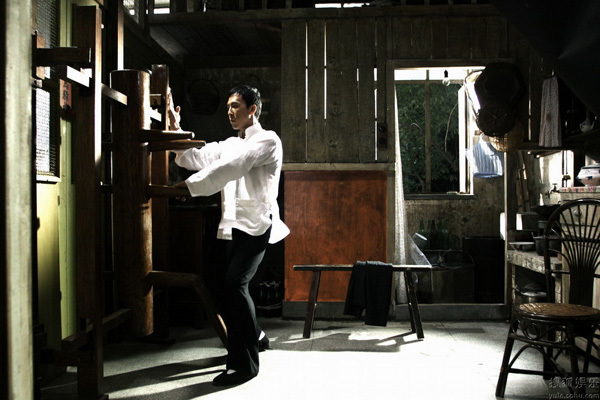 In fact, the movie’s opening shot featured Donnie Yen (as Ip Man) hard at work on his dummy, planted in middle of a well-appointed Chinese living room. This one sequence did a lot of work for the director, establishing for the audience Ip Man’s essential nature as a solitary Kung Fu master. Here was someone lost deep in thought, but he kept those thoughts to himself. One might next want to compare these scenes to the more realistic portrayal of the role of wooden dummies in Herman Lau’s film, “Ip Man the Final Fight.” This project was the most historically faithful of all of the Ip Man movies. For instance, Wing Chun aficionados will appreciate the sudden appearance of a hanging (or “Living”) Jong once Ip Man moves into a small apartment. Of course this style of dummy, now the most commonly seen, was invented by the historic Ip Man as a solution to the constraints of training in small apartments in Hong Kong’s crowded cityscape. Collectively these films have done much to promote Wing Chun among a new generation of martial arts students. Donnie Yen’s performance seems to have had the greatest impact on most of the new pupils that I have talked to. And all of them, without exception, have been captivated by the image of him working on the dummy. It seems that for another generation of Wing Chun students the physical existence of the dummy has become an assurance of the authenticity of their new schools practice. Still, this sense of fascination goes well beyond new Wing Chun students. Since the release of the first Ip Man film wooden dummies have started to appear in a wide range of schools that have no connection to Wing Chun or the southern fighting arts more generally. This has even led to a transformation in the commercial market for dummies. It used to be much more difficult to get a decent dummy. Few individuals outside of the southern Kung Fu schools were all that interested in the various types of Jongs. And due to the constraints of space and cost most students were simply content to use their teacher’s dummies for years at a time (much as I did). As a result there were not all that many commercial makers of these items. Given the difficulty in manufacturing and shipping a decent dummy, it didn’t seem like the sort of thing that anyone would get rich selling. The situation today is somewhat different. A number of small companies in North America and Europe are making very nice dummies, as are a handful of manufactures in Asia. Recently a large number of firms in China have jumped on the bandwagon and have begun to mass produce dummies. Both the quality and price of these models can vary tremendously, so one must do their due diligence. Yet it is clear that there is now a market for dummies beyond the traditional Wing Chun buyers. I occasionally wonder about how these other Jongs are likely to be used (or if they will be used at all). It is not advisable to simply walk up to wooden dummy and start punching it like it’s a heavy bag. Using the Jong safely and effectively requires the adoption of certain angles and distances that could be very different from whatever style these buyers might be most familiar with. Of course there are a number of DVD’s and Youtube videos offering to teach the dummy form, though I am not sure how helpful they would be to someone from a structurally incompatible art. In the end I suspect that many of these dummies are being bought more for their symbolic than practical value. While watching cartoons with a nephew I recently saw that the animators had included a wooden dummy in a ninja training hall on the popular show “Teenage Mutant Ninja Turtles.” I was forced to wonder what a bunch of traditional Japanese assassins were planning on doing with a Wing Chun Jong, but it seemed pretty natural to my nephew. The myth of the Hall of the Wooden Dummy Men, translated through the lens of Ip Man’s struggle against imperialism and economic marginalization, is once again spreading the influence of the Southern Shaolin arts. Fung Sheks first dummy, owned by Ip Man, now on display at the Ip Man Tong in Foshan. Source: Ip Ching and Ron Heimberger. Mook Yan Jong Sum Fat. 2004. Ethnographic artifacts play an important role in certain sorts of cultural and anthropological studies. Students of the martial arts seem to understand this intuitively. The weapons, training tools, publications and fine arts created by hand combat students all tell us something about the world that they lived in. Wooden dummies are a particularly rich source of insight for those interested in the history and evolving social identity of the southern Chinese martial arts. While I have briefly discussed the historic evolution of Jongs elsewhere, I think that at some point it might be fun to do a history of Wing Chun told from the perspective of the physical and symbolic evolution of the wooden dummies that it has come to be so closely associated with. As artifacts dummies are uniquely illuminating. To a practitioner they reveal a wealth of encapsulated information about the basic nature, and assumptions, behind an art. As a student of martial studies they tell me exactly where I am located in the evolution of the Wing Chun (and southern Chinese martial arts community more generally). Is it a “buried” dummy or a “living” one? Is it laminated, solid or PVC? Was it made in Hong Kong, China or North America? Each of these small differences tells me something important about how Wing Chun has traveled the currents of globalization, and where I am actually situated on this foggy sea. The anthropologist Victor Turner once observed that all artifacts seem to have two properties, one practical and the other symbolic. Something as utilitarian as a digging stick might be sharpened on one end, and adorned with a feather on the other. Nowhere is this tendency more pronounced than in the realms of traditional Chinese weapons and military training. The humble woven rattan shield was often pained with auspicious designs and red tassels were tied to the ringed hilts of peasant swords. This same basic tendency is evident in the history and spread of the wooden dummy. For so many modern students and consumers, mastery, or even simply the purchase, of a dummy is a way of uniting themselves with either a mythic past or a lineage of revered ancestors. On a purely symbolic level it can do the former whereas actual study of its techniques might help to accomplish the latter. Yet as these tools “unite” us with the past, they also reveal the many subtle (and sometimes profound) disjoints that mark the modern martial arts as being distinct and separate. Yet no symbol or bodily experience is totally self-interpreting. As such these artifacts are likely to have a symbolic or socially constructed meaning that goes well beyond their technical use. It may even stretch beyond the small group of practitioners who specialize in the exploitation of a given object. This socially defined meaning might draw off of a wide variety of other practices, stories or media. The challenge for students of martial studies when looking at the use or evolution of something like Wing Chun’s wooden dummy is to find a way to synthesize both their practical and social meaning. In order to learn something new about the groups that use these tools we need to be able to understand them from both of these perspectives. If you enjoyed this you might also want to read: The Dadao and the Militarization of the Chinese Martial Arts. I couldn’t help thinking of the journey to hell and back. It was a common theme in plays, and local versions of the epics often had a journey to hell scene worked in. Of course these were usually mimed, but I believe there was a temple carnival version, sort of like a house of mirrors or a makeshift haunted house in the west. In any event this type of play was even more common in shadow plays because they could show all the torture devices. The language of “buried vs. live” does suggest the supernatural. Could this device be training for the journey to hell?